bit Nove is a powerhouse of technology fully dedicated to listening pleasure: since 2007, the year in which the bit One was first introduced, Audison has never stopped delivering innovation to the digital processors segment. 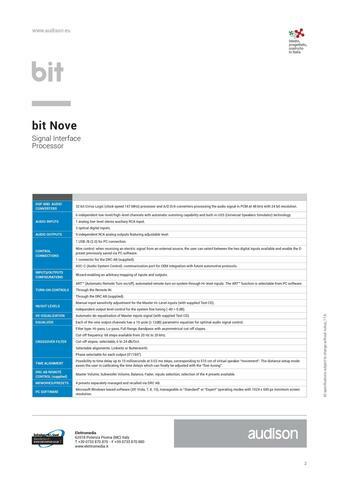 The bit Nove was born from this unique know-how within the industry, the perfect tool to expand a car audio system maximizing its performance. 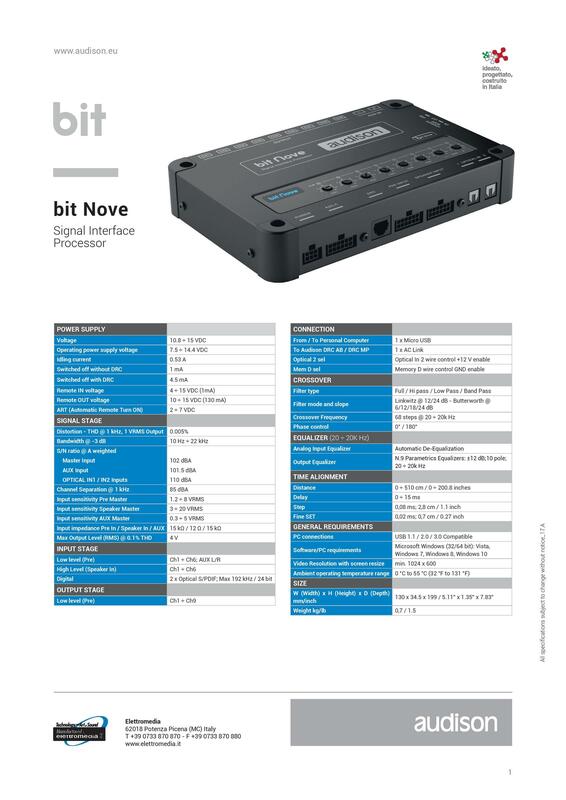 Equipped with 6 high (3 ÷ 20V) and low (1.2 ÷ 8V) level inputs, the bit Nove can be used with any type of aftermarket and OEM source. The auxiliary RCA input (0.3 ÷ 5V) is perfect to connect your smartphone or tablet to the bit Nove providing the highest possible quality. 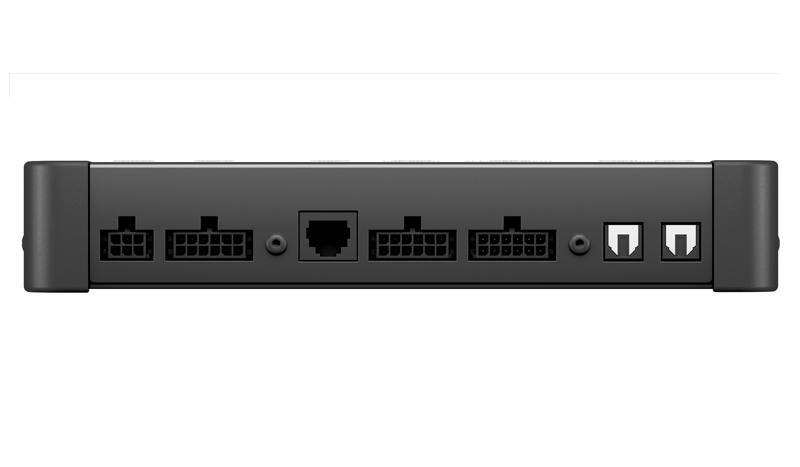 The advanced PC software sums up the channels belonging to the same front and de-equalizes the OEM source frequency response in a few simple steps. 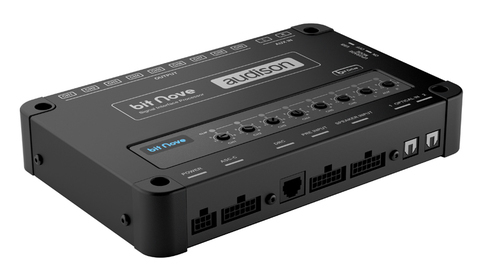 There are also two optical digital inputs with a maximum accepted resolution of 192 kHz/24 bit to simultaneously connect an Audison bit DMI to the bit Nove (taking the digital audio from the car MOST bus) and the Hi-Res bit Play HD player. 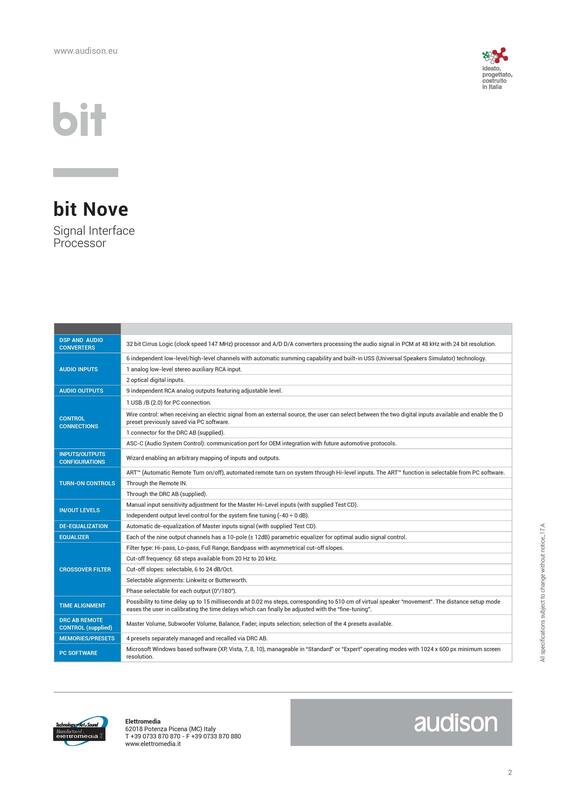 Thanks to the integration of the USS technology, the bit Nove can also be connected to headunits featuring the “speaker load detection” circuit that would otherwise mute the audio signal output. 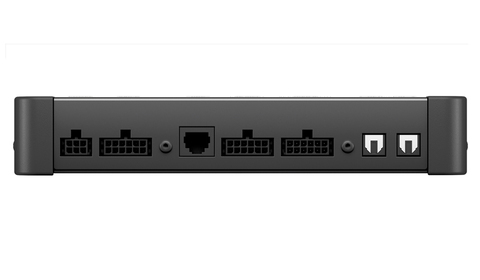 The bit Nove features nine output channels on RCA connectors providing a large number of active multi-amplified configurations, ensuring a wide range of set-up options to the installer. 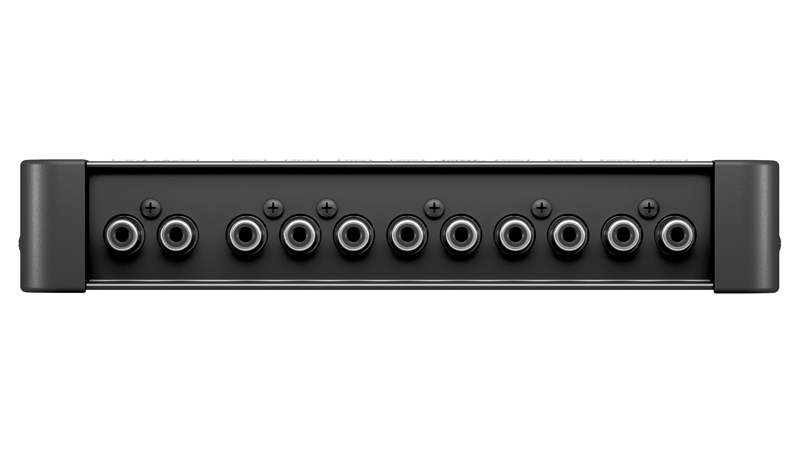 For each channel, the powerful DSP provides: a 10-pole parametric equalizer allowing for optimal adjustments, a 68 steps frequency crossover, Butterworth or Linkwitz-Riley type filters with slopes from 6 to 24 dB/Oct and a time-delay line.